It’s all been downhill since Lauren Weisberger’s successful 2003 bestselling debut novel The Devil Wears Prada (whose film adaptation is even more successful and beloved than the novel—or supposed roman a clef—was). Her second novel Everyone Worth Knowing was fun and readable though hardly substantial, but her third novel Chasing Harry Winston is quite possibly her worst book to date (even more so than the drivel that is Revenge Wears Prada). However, as terrible as the book Harry Winston is in textual form, a curious thing happens when you listen to the audiobook: it becomes highly entertaining and engaging! The audiobook is voiced by Lily Rabe, who is singlehandedly the reason the book is so successful in this format. Rabe dives into the story, bringing unique voicing to the trio of women who serve as protagonists for the novel. Her Emmy is squeaky and unsure of herself going into her thirties as a recently dumped single woman. Adriana comes off as chic and confident and endlessly entertaining with Rabe’s deep, throaty, sultry voice for the character—sounding like a completely different person. And Leigh, in Rabe’s “normal voice,” is the stubborn one whose struggles with her impending marriage and her job as an editor feel the most fleshed out and relatable. Overall, Rabe sounds like she is having so much fun acting out the story that you can’t help but enjoy it, even at its most eye-roll-inducing. I will forever love and read Lauren Weisberger if only for the nostalgia of when I first read her novels and loved them with all the joy of a guilty pleasure. But her novels translate better into audiobooks, letting strong actresses (like Merritt Wever!!) bring out the best, entertaining aspects of the novel. 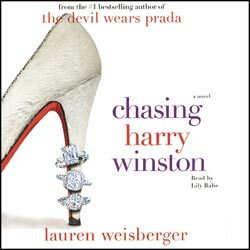 And Chasing Harry Winston is such a treat as an audiobook.